A removable bowl for ease in cleaning. Simply unscrew the bowl from off the base and wash it easily in the sink with warm soapy water along with the center column and tiers. The electronic temperature control panel has four different temperature settings which allow you to more easily run different types of fondue. For example: Cheese may require the temperature to be a little hotter while white chocolate needs to be a little cooler while running through the chocolate fountain. You can melt the chocolate for the chocolate fountain right in the bowl. Just pour in the Sephra chocolate fondue chips and the chocolate will be melted in about 45 minutes. Make sure to stir the chocolate every few minutes while it is melting. 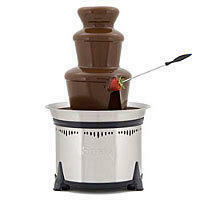 Three adjustable feet make it easy to level the chocolate fountain on any surface so you can obtain the classic Sephra chocolate fountain look of cascading chocolate off the three tier levels.